The Amazon sales rank – also called the Amazon Best Seller Ranking (BSR) or Best Seller List – is still a mystery for many sellers. This article will explain the meaning of the Amazon sales rank and how it’s calculated, as well as various ways the Amazon sales rank is implemented as an indicator of performance. The Amazon sales rank shows how well a product is selling relative to other (competitor) products in the same category. A product with sales rank #1 is currently the most-purchased product in that category; a product with sales rank (or best seller ranking) #2 is the second most-purchased product in that category, etc. In other words, you can see how many other products are selling better than your own. For example, if your product has a current rank of 20 in the Amazon best sellers list, then that means there are 19 other products in the same category that have a higher sales volume. Note: It’s important to remember that only products within the same main category are taken into consideration when calculating your sales rank. That means, for each main product category there is one product in first place, one in second, one in third, etc. One product can, however, have an Amazon sales rank in more than one sub-category (see screenshot below). This is why one product can rank #452 in the main category ‘Beauty’ but be ranked at #36 in the subcategory ‘Bath Accessories’. How is the Amazon sales rank calculated? Amazon itself doesn’t reveal exactly how the sales rank is calculated, which is why there are only theories and speculation surrounding the method. It’s relatively evident that sales volume alone is taken into consideration and not other figures such as number of reviews, retail price, etc. It’s unclear, however, which time frame is taken into consideration for the sales volume. Some theories conclude that only sales from the last 12 hours are counted; Others posit time periods of 24 hours or more. We think that the sales volume from a considerably larger window of time is taken into consideration when calculating the Amazon sales rank. If only sales from the last 24 hours were counted, then all products which weren’t purchased in the last 24 hours would have to have the same sales rank. But this isn’t the case. 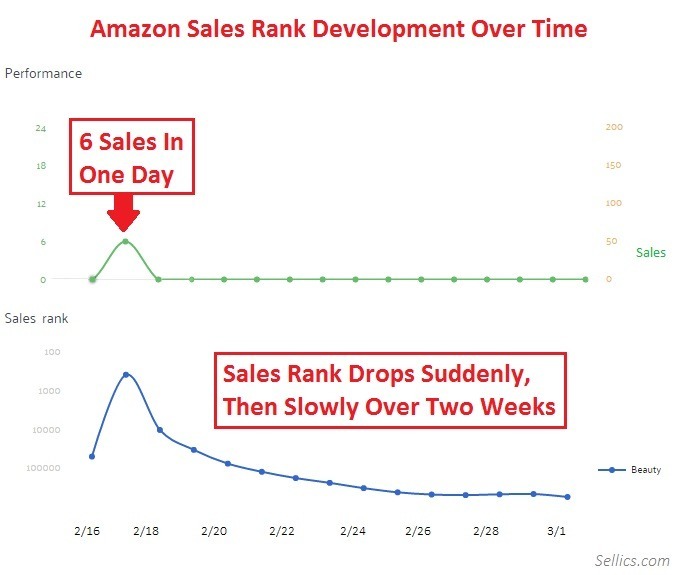 If purchases aren’t being made, then the Amazon sales rank falls systematically over the course of many weeks – which shows that Amazon takes a considerably longer purchase history into consideration for the Amazon best seller ranking. It’s unclear, however, what exact kind of weight earlier purchases have in the calculation. That is, how much influence a purchase has on the sales rank as time passes. The assumption basically suggests itself: More recent purchases are weighed more heavily than older purchases in the calculation. What does this mean? A sale made 6 days ago is worth – in the Amazon sales rank calculation – less than a purchase made just a minute ago. For example: Product A has generated sales at the beginning of the week, and Product B generated the same number of sales at the end of the week. Product B will have a better sales rank than Product A, because the sales were more recent. After Amazon has added the sales of each product and weighed them correspondingly by how recently they were made within the last calculation period, Amazon compares these values and sorts all products within a category in descending order. The position of a product in the (best sellers) list corresponds, then, to the sales rank. Why does the Amazon sales rank fluctuate? Sometimes there’s not an obvious explanation for large changes in the Amazon sales rank from one day to another. It’s important to remember that the sales rank isn’t updated in real time. Normally (in the top 10,000 products in a category), updates to Amazon’s sales rank happen hourly. Products ranking between 10,000 and 100,000 in the best sellers list are re-calculated daily. Any rankings over one hundred thousand are calculated anew monthly. Therefore, one additional sale of your product might not lead immediately to an improvement in the sales rank for the category that is relevant to your product. One single sale can have a large impact on the BSR. Many sellers wonder how their listing can jump from 100,000 to 10,000 within one day. If one assumes that products with a sales rank of 100,000+ are only sold once every few days, then even one sale can lead to a drastic improvement in ranking. If a product doesn’t make any sales in the ensuing days, then the ranking will begin to slowly fall. The screenshot below shows development of the Amazon sales rank of a real product on Amazon. In one day, there were 6 units sold, and then no sales in the days afterward. The Amazon sales rank first falls in large intervals, then tapers off more slowly. How can the Amazon sales rank be used? 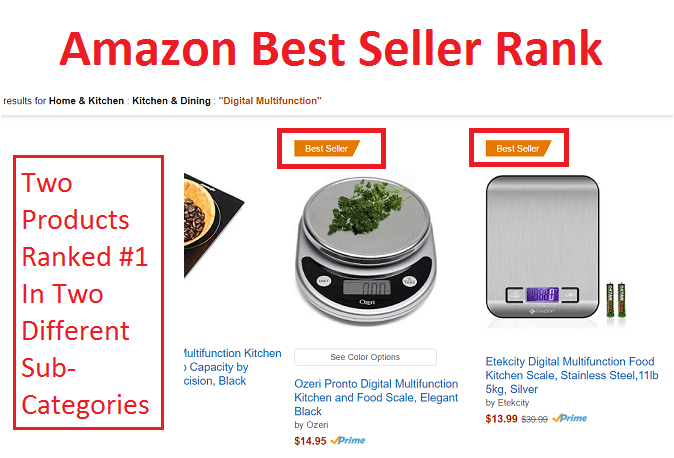 The Amazon best seller ranking can be used for a variety of purposes, and isn’t only interesting for people who are already selling on Amazon. When looking for new products in a line of goods, you can greatly reduce the risk of investing in a slow seller with the help of the BSR. If you want to select a new product that will be successful on Amazon, the first question is whether it can generate enough demand. The Amazon sales rank is a very good way to estimate demand for a product. The better the sales rank (a lower number = better rank), the more sales it’s getting on Amazon. New sellers, as a general rule, search for products with a sales rank lower than 5,000 or even 2,000. Even seasoned Amazon sellers can gather important information by glancing at the Amazon best seller list. Competitor monitoring, above all, and comparison with the toughest competition (benchmarking) are placed here at the forefront. If similar products have a better ranking, then that means there’s room for improvement for your own product. It’s therefore quite important to keep an eye on the Amazon sales rank of your own product as well as that of your competition so you can draw conclusions about how to optimize your own Amazon listing. How can I improve my sales rank on Amazon? After reading through an overview of Amazon’s sales rank – what it is, how it’s calculated, how often it’s updated and its various uses – the question inevitably arises: What can you actively do to improve your own BSR? The answer seems as banal as it is complicated: generate more sales on Amazon than your competitors. Because the sales rank is a relative figure, you have to keep an eye on your own sales volume as well as that of your competitors. If you sell 4 more units per day, but your strongest competitor does as well, then your ranking won’t improve. How can I beat my competitors? Our Sales Rank Tracker will check your product rankings every day, and display the development of your sales rank in a handy chart. To research new products on Amazon, you can also use our Product Research tool; browse through more than 700,000 Amazon products in our database, easily filter by sales rank, and determine the best sellers in your product category. What is a good ACoS for my Amazon PPC Campaign?